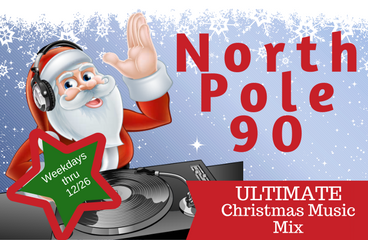 Pioneer 90.1 Radio » North Pole 90 – The Ultimate Christmas Music Mix! North Pole 90 – The Ultimate Christmas Music Mix! It’s the Ultimate Christmas Music Mix, playing weekdays December 1st through 26th. Text your holiday requests to (218) 416-0456. Call us at (218) 683-8588. Or use the “Send Voicemail” tab at the right of this screen to send a holiday greeting for us to play on the air.